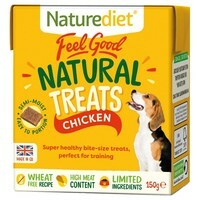 Naturediet Chicken Dog Treats are natural and delicious real meat treats made with premium grade British Chicken, Rice and Vegetables. Gentle on delicate tummies, highly palatable and super healthy, these semi-moist hypoallergenic treats are perfect for use as a training aid or reward. Naturediet Dog Treats are free from Wheat Gluten, Artificial Preservatives, Colourings, Flavourings, Meat Meals and Animal Derivatives.